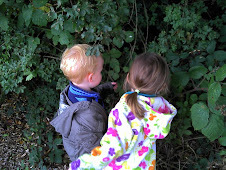 Little Garden Helpers: Whose Garden? Garden Girl has really taken ownership of our vegetable plot. This weekend we stayed with Garden Dad's parents for Uncle M and Auntie H's wedding. We took a box full of homegrown veggies with us; carrots, spring onions, courgettes and marrows, beetroot, runner beans, cucumbers and tomatoes. Grandma South congratulated me on my growing success, much to the indignation of Garden Girl. 'And me. And me. I helped. I grew them too.' She was clearly very proud of her acheivements and rightly so as she has worked hard all year. But she wasn't quite willing to accept that Garden Boy deserved praise for his efforts, claiming that he just played with the soil. But we reminded her that he has learned to sow seeds by watching her hard work. 'Yes' she nodded thoughtfully, definitely proud of her teaching acheivements and possibly proud of her little brothers ability to learn. The garden obviously occupies Garden Girl's mind even when we are away. One evening while we were camping in North Yorkshire a conversation before bed revealed her concern for the vegetables she had left behind. Me; Because the sun goes to bed to let the moon come out. Garden Girl; And will it cloud over so the rain can come? Garden Girl; And then our vegetables can have a drink and grow? Me; Yes, Our vegetables will be growing while we are here. Garden Friend's Daddy will be looking after them for us, giving them water if it doesn't rain enough. Garden Girl; He won't sit on them will he? Me; No. I am sure he won't. Garden Girl; Will Garden Friend stop him? Me; Yes. Garden Friend will make sure his Daddy doesn't sit on them. Garden Girl; Good. Can I go to sleep now? Of all the disasters I might have imagined happening to our vegetables while we were away, Garden Friend's Daddy sitting on them wasn't one, but it had clearly been worrying Garden Girl. In the interests of a good nights sleep I refrained from telling her that her faith in two year old Garden Friend was a little misplaced. He was far more likely to sit on, eat or dig up her vegetables. Though perhaps she feels her garden is in better hands when managed by a toddler. She certainly thinks she is the head gardener. I love her concerns. I take it you don't have garden dog who a) likes to jump into the middle of the plot and b) has taken to digging up the onions and removing the tomatoes from their plants. She is going to be an amazing gardener one day. Can she come over here and help us out sometime? We've in dire need of someone who knows what they are doing!